Some people can’t remember what they had for breakfast and others can remember what they had for lunch on their birthday 2 decades ago and the flavour of the icing on their cake that year. If you fall into the latter category and your food memory is of a certain vintage, you may recall encounters with Beef Wellington in its fashionable heyday. The Kennedys’ French chef was serving it in the White House, as were New York restaurants like the Pierre on Central Park South and, if the number of versions of it in magazines, newspapers and cookbooks from the sixties is an indication, housewives in large numbers were making it for their dinner parties. 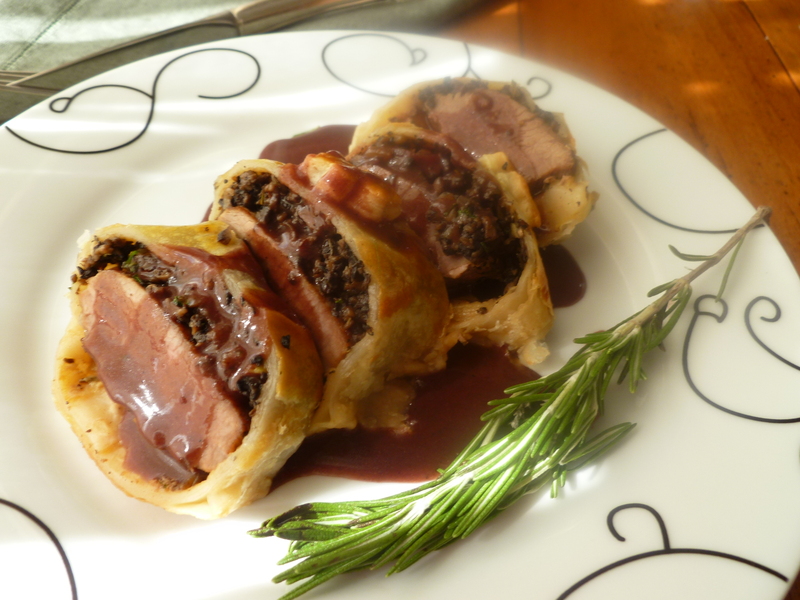 Inevitably, however, Beef Wellington–and all other meats served in the Wellington manner– went out of style. Fashion isn’t a sound arbiter of tastes in food–or anything else. The appetite it feeds and never satisfies is a hankering for change. Over the years it has given us lots of odd and remarkable blips on the food timeline. 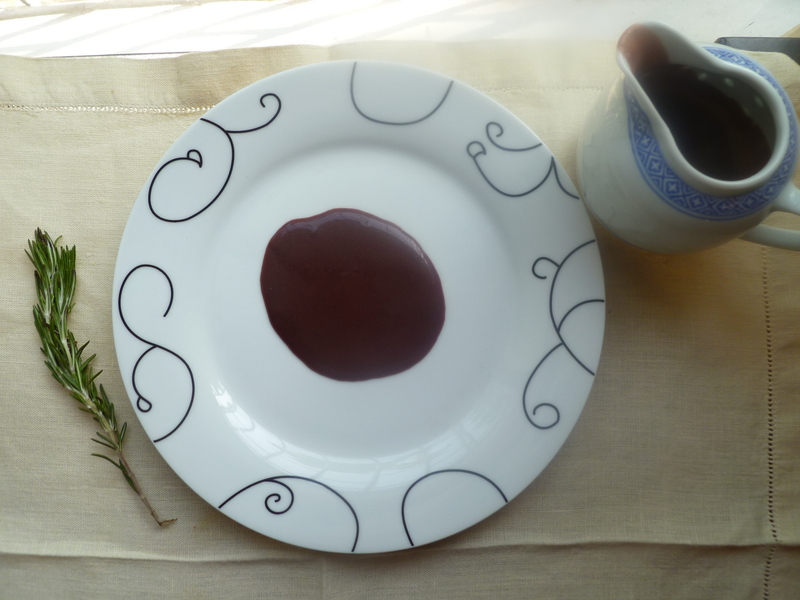 Culinary historian Sylvia Lovegren wrote a book about them called Fashionable Food. In it you will find the bygone chic and the disrememberd rages of their day– like Fruit Cocktail and Spam Buffet Party Loaf (“a party loaf that combines fruit cocktail and Spam with gelatin, Miracle Whip , and paprika for the ultimate in decadent, yet proper, Fifties food”) , Campbell’s Mystery Cake (its secret ingredient was a can of the company’s tomato soup), and a ’20s favorite–Banana Popcorn Salad. 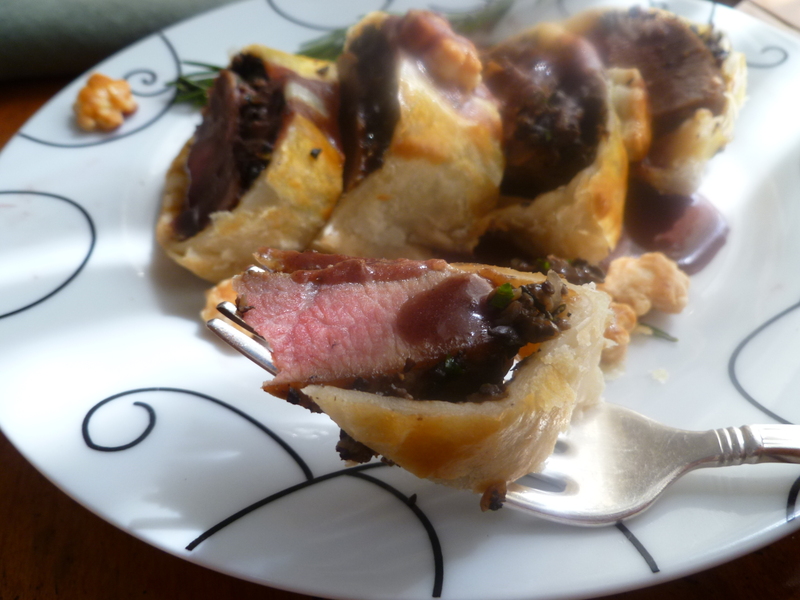 Beef–and lamb–made Wellington style have been alternately lauded and snubbed by food fashion critics. 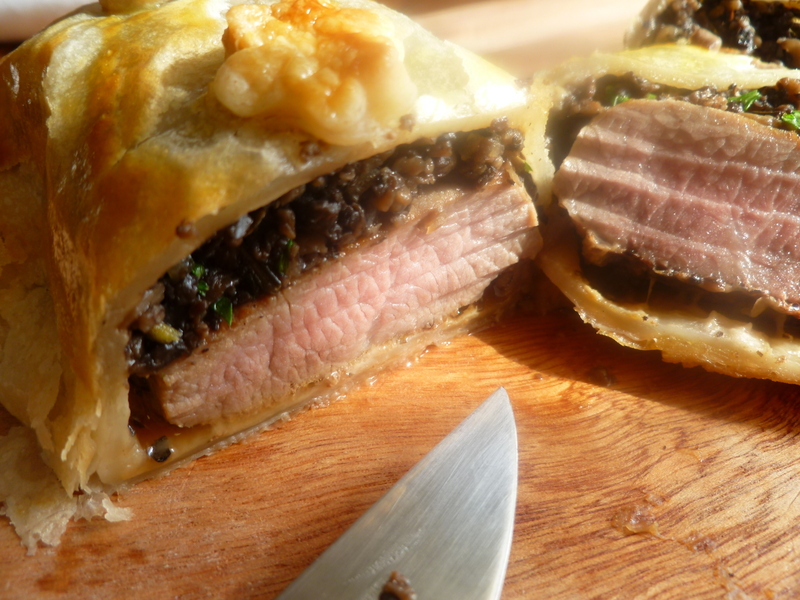 But whether the Wellington is in vogue or out of it, wrapping up a good piece of meat in pastry with some herbs and mushrooms is a recipe for all seasons. 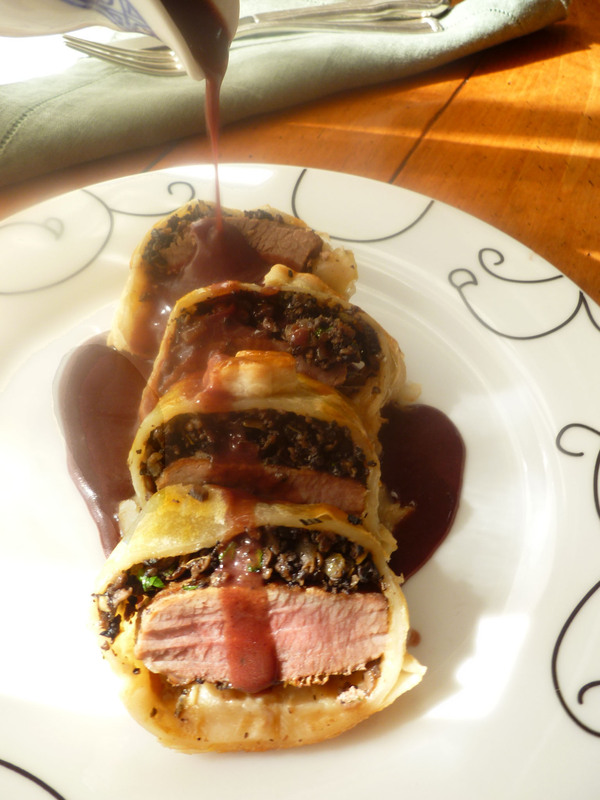 A Second Note : The Loins of Lamb Wellington are wrapped whole in pastry, and, when done, sliced and divided among plates. 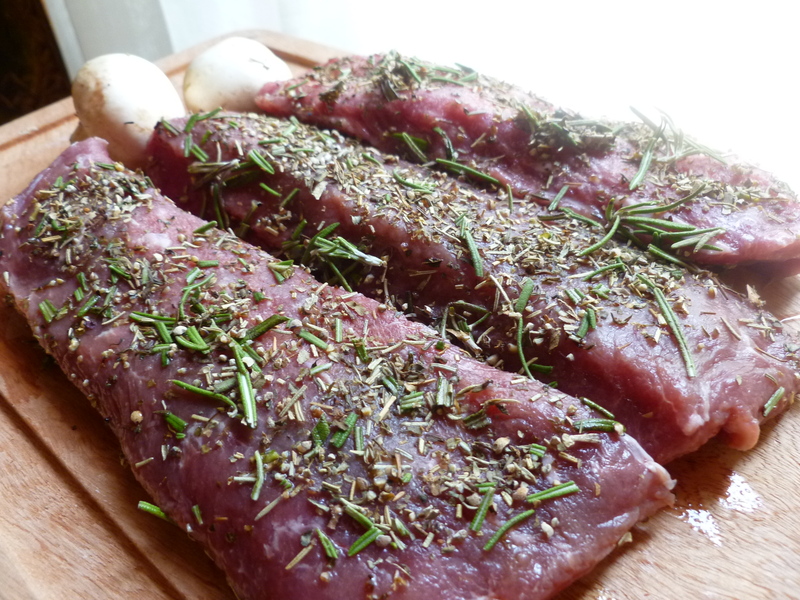 Although a half a loin is enough for one person, the diplomatickitchen recommends making 6 loins for 8 people. Slicing each whole loin into exactly 8 slices so that you have 4 for each plate is not easily done every time. The extra 2 loins insure that, once they are cut, there are at least 4 slices of Wellington for each person. Besides, people will not mind having a little more than ‘enough’. 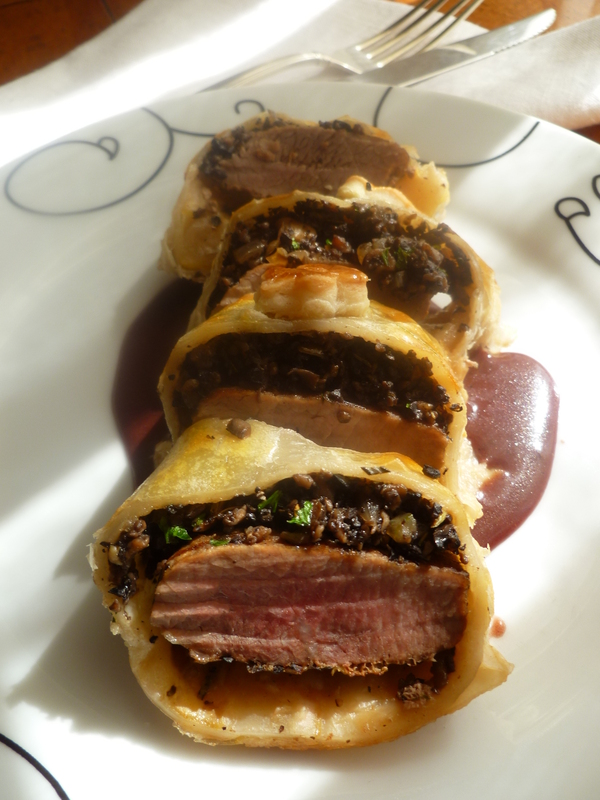 And One More Note: Loin of Lamb Wellington is not complicated to make, but it does require allowing sufficient time for the loins and mushroom stuffing to cool before wrapping them in the puff pastry. This means that it’s best to grill the loins and make the stuffing about 2 hours (or more) in advance. 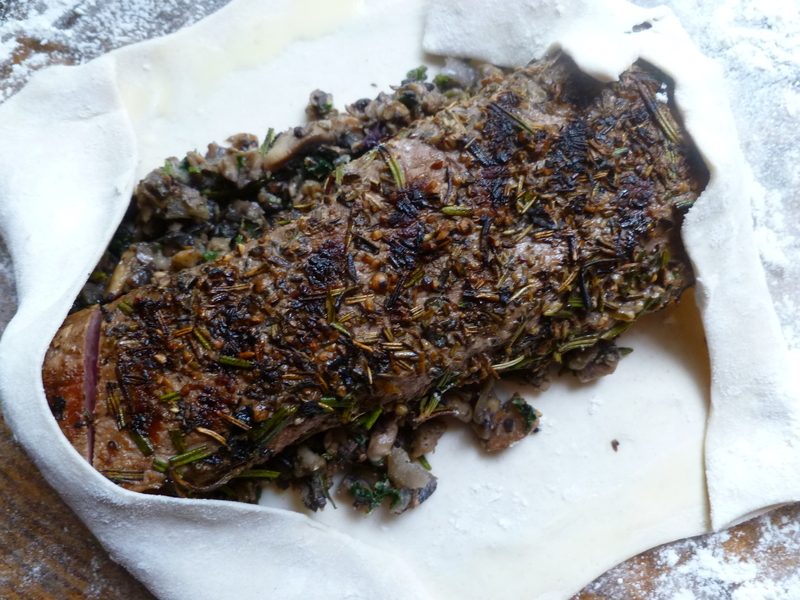 Once the lamb and stuffing are cooled, Lamb Wellington becomes a very dinner-party friendly Main Course because the Wellingtons may be put in the pastry several hours ahead of actually baking them, placed on the baking sheet and refrigerated. Bring them to room temperature before putting them in the oven. 6 rectangles of frozen Puff Pastry (Pâte Feuilletée), thawed in the refrigerator: The sizes of rectangles vary with the brand, and you might need fewer whole pieces of pastry. The sheets used for the photographed Wellingtons measure 7-inches by 4 inches. 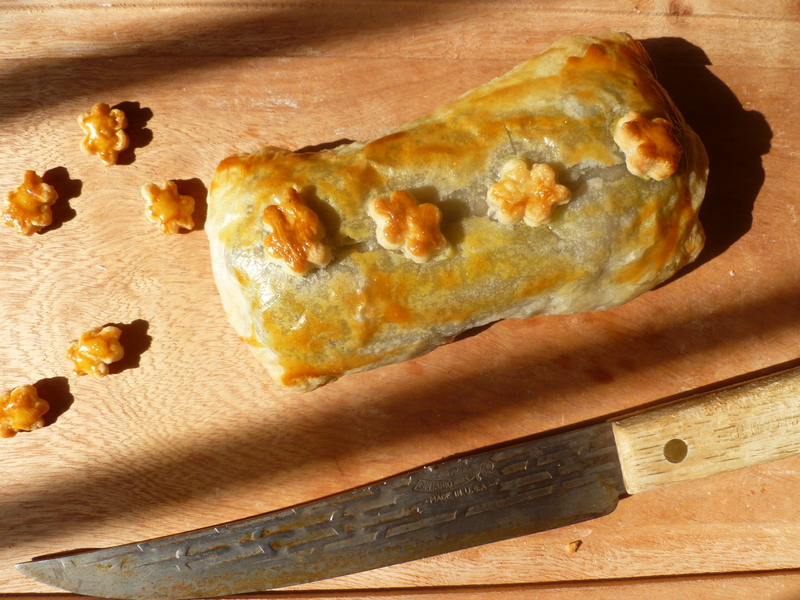 Extra pastry may be cut into shapes to decorate the tops of the Wellingtons and guests’ plates. 2 egg yolks, well-beaten in a small bowl: the whites may be frozen and used for something else–to make meringues or for the meringue topping of a pie, for example. 6 Tablespoons of butter, cut in pieces and well chilled: putting it on a small saucer in the freezer, 30 minutes before making the sauce, is a good way to make sure it’s cold enough to thicken the Sauce instead of simply melting into it. a Stove-Top Grill: The ridged side is used for this recipe. 2. Heat the ridged side of the stove-top grill until it is very hot. Quickly brush melted butter over the ridges and place the loins on the grill. Grill them for 2 minutes–turn them and grill another 2 minutes. Pour the Cognac over them and ignite it. The flame will die quickly. As soon as it does, remove the loins to a platter. 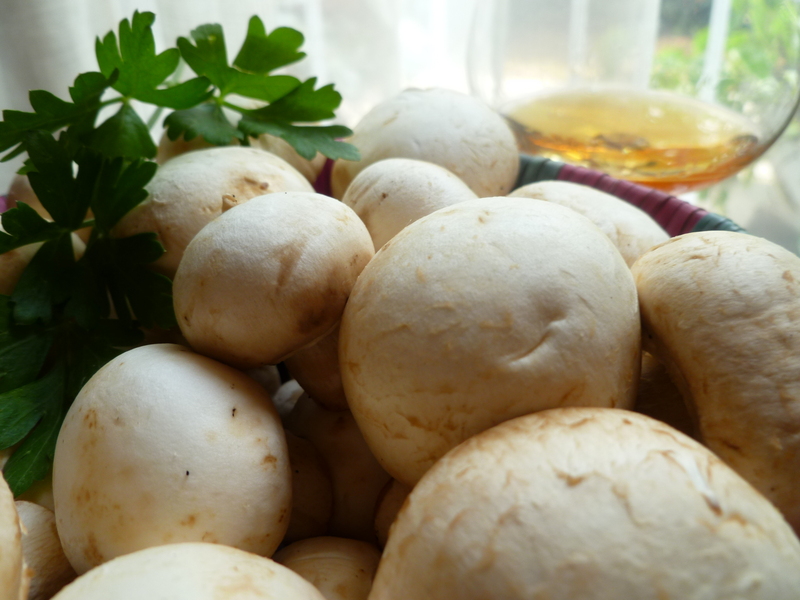 When they are no longer steaming, put them in the refrigerator to cool. 1. Melt the butter in the pan, add the onion and shallots and cook them, stirring them around, over medium heat until they soften and begin to turn golden at the edges. 2. 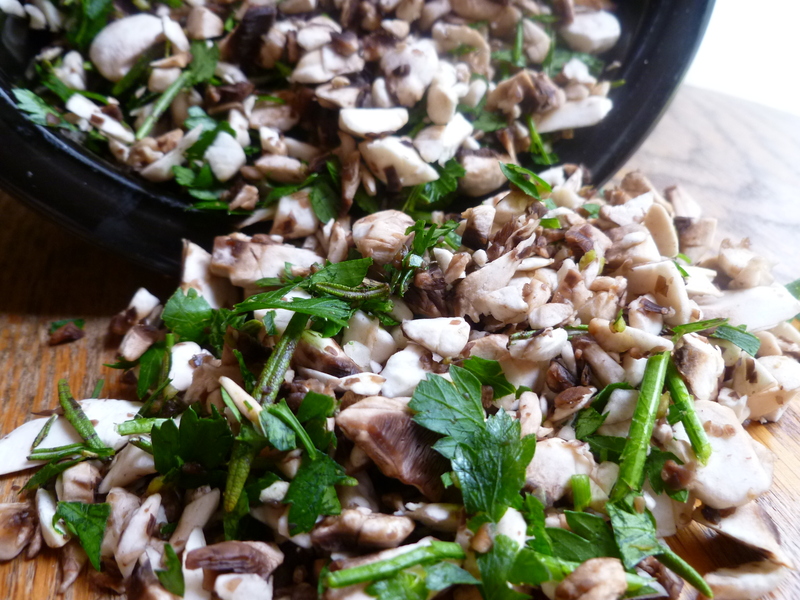 Add the finely chopped mushrooms and cook, stirring occasionally, until the liquid from the mushrooms evaporates and they begin to darken. 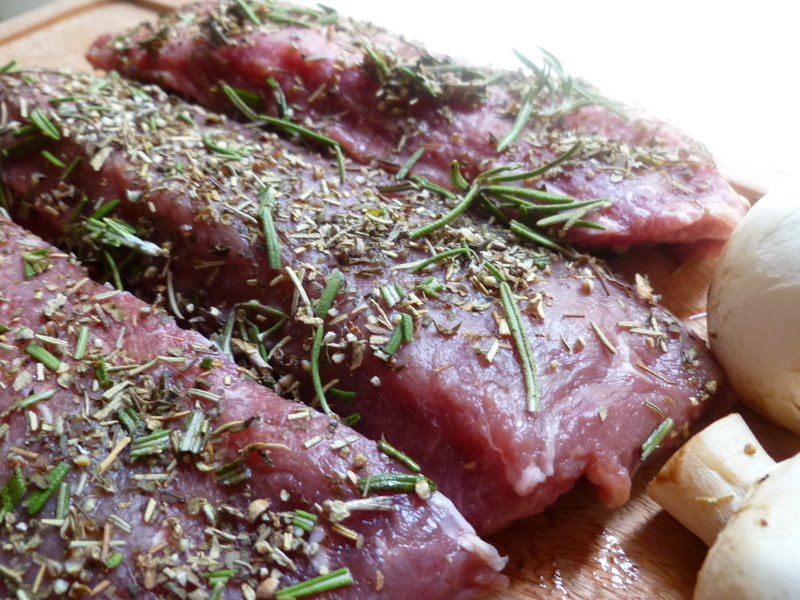 Remove them from the heat and add the parsley, rosemary, Cognac, and a few grinds of black pepper and salt. 3. Cool the stuffing in the refrigerator. 1. To form a Wellington, roll out a pastry rectangle into a bigger one measuring about 10-inches long and 8-inches in width. 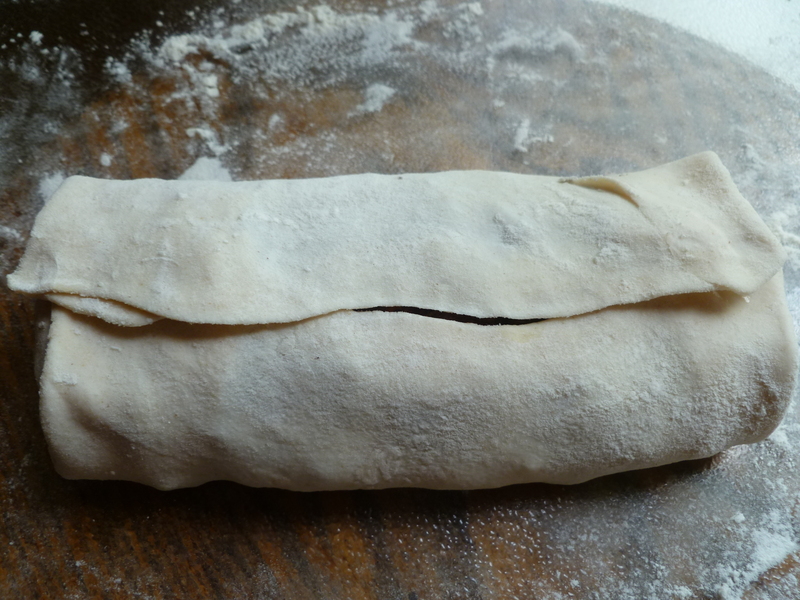 Take the pastry up in your hands and stretch it out gently in both directions to even the sides of the rectangle. Put it back on the pastry board, a long side facing you, and trim the edges of the rectangle. Place the bowl of beaten egg yolks close by. 6. 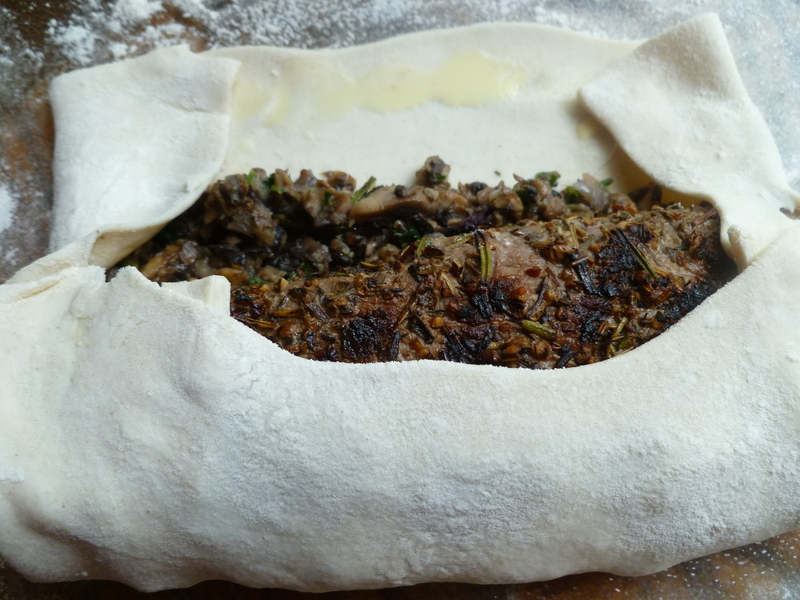 Put the Wellington on the parchment-lined baking sheet, seam-side down. 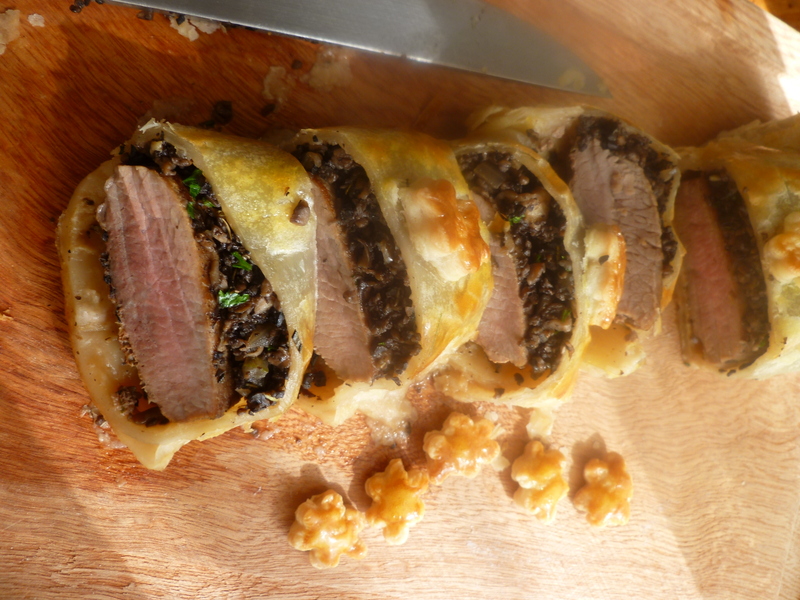 Assemble the rest of the Wellingtons in the same way. …Make some extra cut-outs–enough to decorate 8 plates– place them on the baking sheet as well. 1. Chill the pieces of butter in the freezer for about 30 minutes. 2. 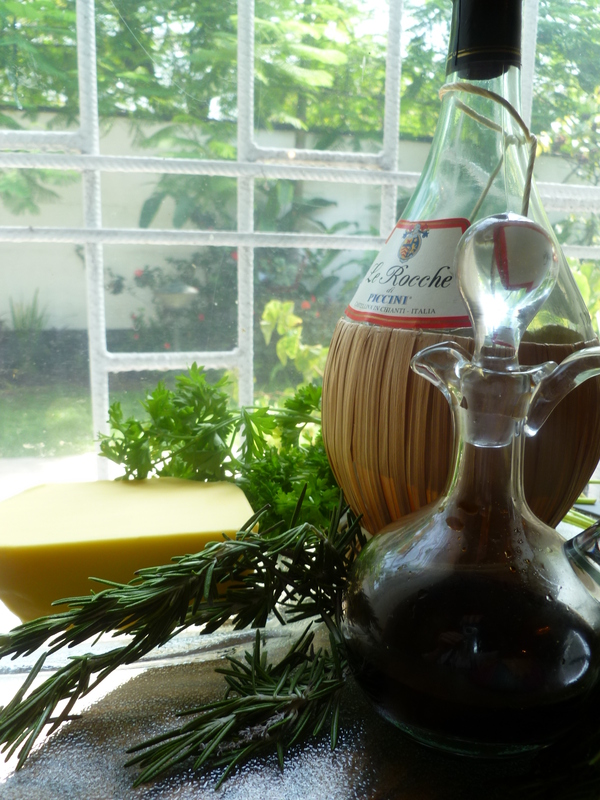 In the pan combine the water, fond de veau powder or bouillon cubes, the red wine, the vinegar, shallot, rosemary, thyme and parsley. Bring the sauce ingredients to a boil over medium heat. 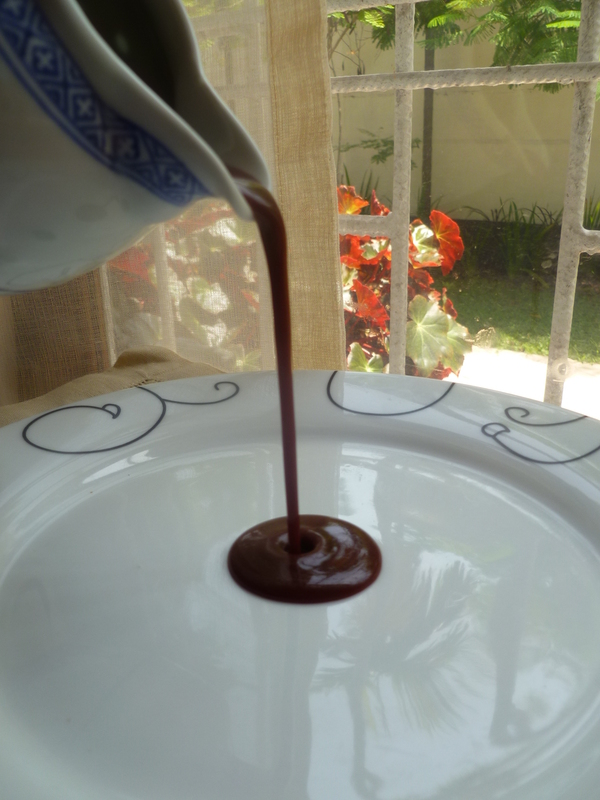 Then, reduce the heat and let the liquid reduce slowly. Scrape the solids that cling to the sides of the pan back down into the bubbling mixture now and then. 3. When it’s reduced sufficiently, the surface of the liquid will be a mass of bubbles and it will make a low gurgling sound. 4. 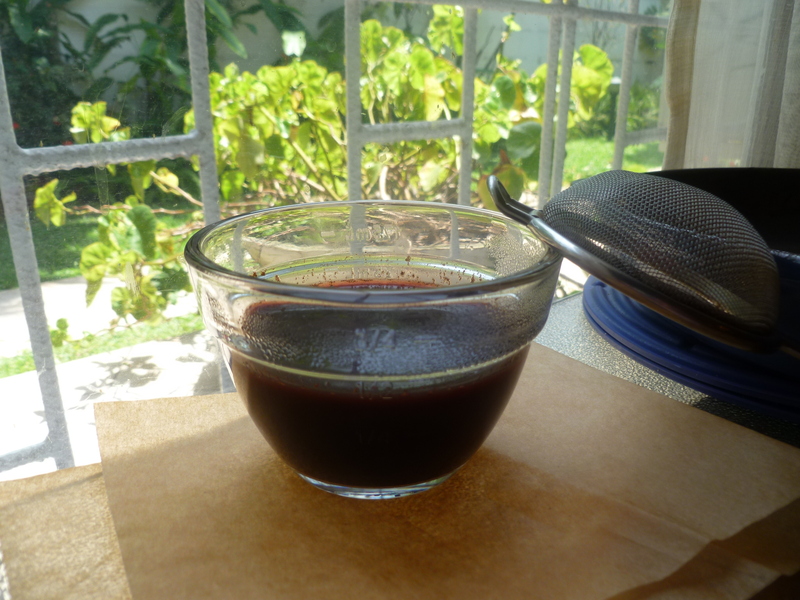 Pour the reduced liquid through a sieve and into a liquid measuring cup, pressing down on the solids. Put a little water in the pan and stir it around to wipe the last bits of thick, syrupy residue from it and pour it through the sieve as well. Once reduced, there should be about 1 cup of sauce. If there is less, add a little more water to make up the difference. 5. Return the reduction to the pan and bring it back to a bubbling simmer. Turn off the heat and whisk in the bits of butter, one or two at a time. Completely incorporate each addition of butter before adding the next. A Suggestion: If the top of your stove grows warm when the oven is on, place the sauce in a small, heavy saucepan, covered, on top of the stove and it may not require any reheating. If you do reheat the sauce, do it very gently without boiling it. 1. Preheat the oven to 425 F. If the Wellingtons have been refrigerated, they should come to room temperature before going into the oven. 2. 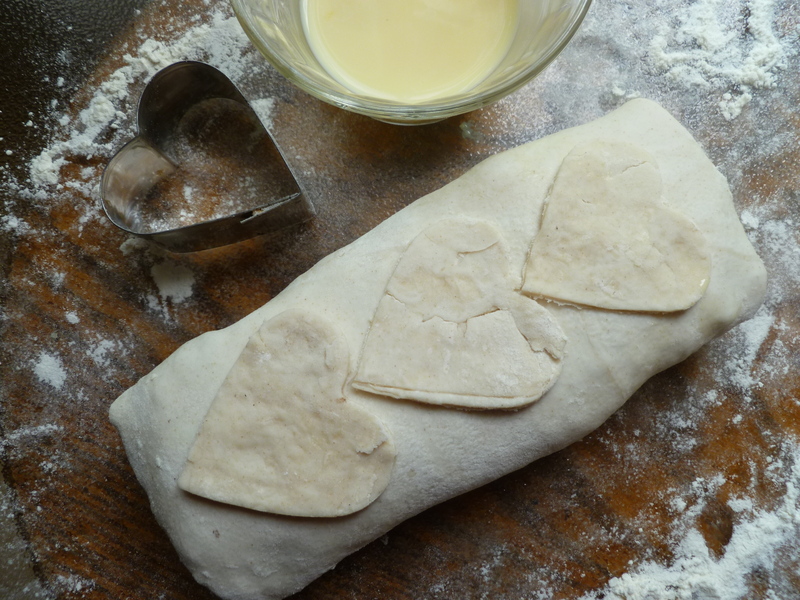 Brush the Wellingtons and the extra cut-out shapes with the beaten egg. 3. Bake them until they are golden–for about 15 minutes. 4. 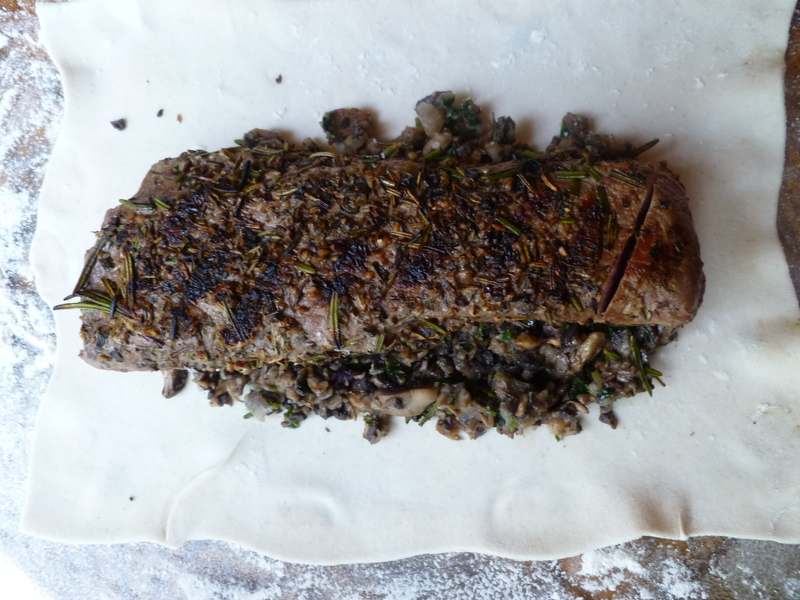 Transfer the Wellingtons to a cutting board…. 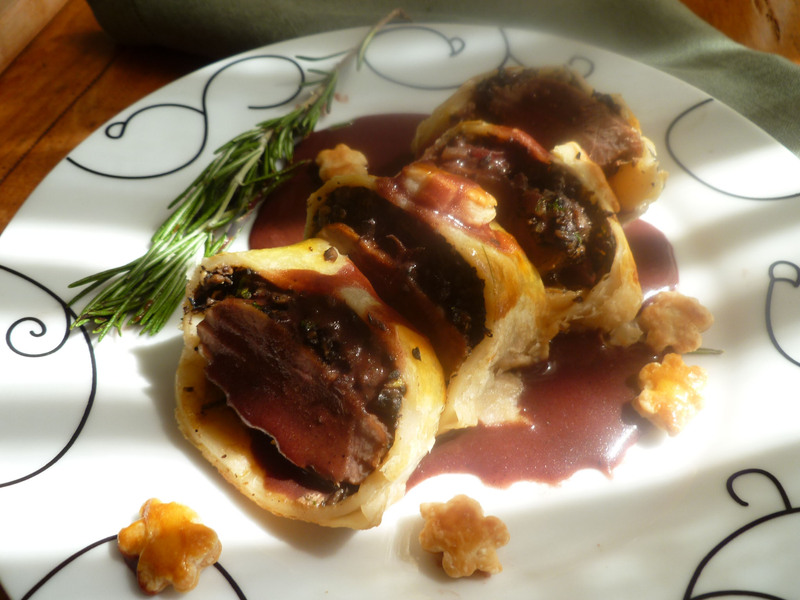 A Note: Boneless Loin of Lamb Wellington with Red Wine ~ Balsamic Sauce is the Main Course in the Dinner Menu: Dinner in Early Spring.